Yayoi Kusama is the most popular artist in the world. Although I've seen and experienced her work many times over the years (here, here, and here are just a few), I still get excited each time I hear of some new Kusama experience. 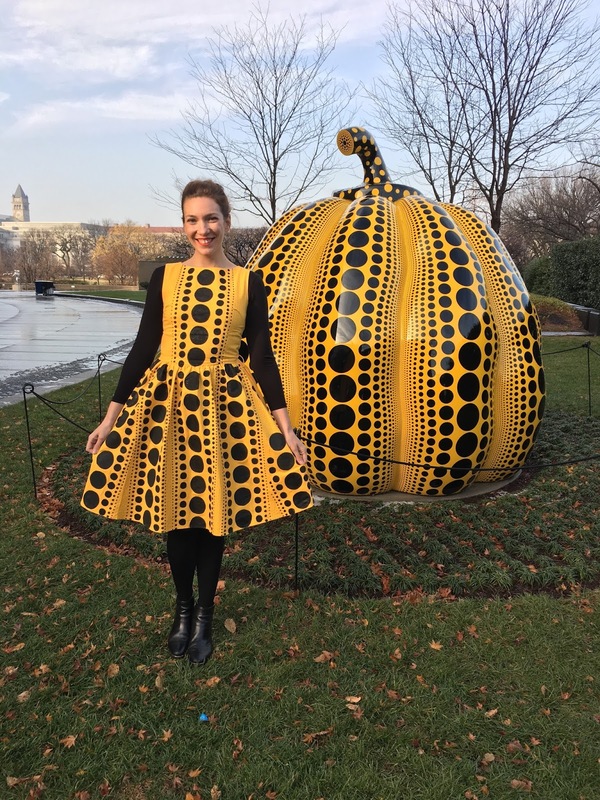 When the Hirshhorn Museum and Sculpture Garden unveiled Kusama's Pumpkin, 1994, a precursor to her retrospective exhibition Yayoi Kusama: Infinite Mirrors, I got to work making a spotted dress to coordinate with the 8-foot-tall sculpture. Kusama sees pumpkins as universal symbols, and even uses them as self-portraits. She has been quoted as saying,"Polka dots are fabulous," and this artwork combines two of her most well-known motifs: a spotted pumpkin becomes a stand-in for Kusama herself and also her vision of the world. Kusama has suffered from hallucinations since she was a child, and her artwork is meant to show the world as she sees it. I experienced a glimpse into her world while I was painting the spots on this dress: the repeating pattern made me slightly dizzy and nauseous at times, and when I looked away from the dress I could occasionally see a polka-dotted pattern continuing in my field of vision. In those moments, I felt that I was connecting with Kusama's work in a deeper way, and in some part understanding what it is like to be her. Yayoi Kusama: Infinite Mirrors opens at the Hirshhorn Museum and Sculpture Garden on February 23, 2017.